That kind of dedication to winning, to being the best at what they do, is what really convinced me that MLG is not just a bunch of nerds playing at being "cyberathletes." These players are fierce competitors who would not feel out of place among more conventional sports heroes. But is competitive Halo fun to watch? In the Finals in Raleigh, Final Boss led the favorites, Instinct, by a score of 5 games to 1. Elamite Warrior and the other three members of Instinct, their rivals for the past two tournaments, opposed them. It seemed that the match was well in hand, that Ogre 2 would get his first win since he dominated the tour back in 2004-2008 and that Victory X would get his first win ever after years of trying. But then Instinct took one match. And then another. Suddenly it was 5-3 and the word "choke" was on everybody's lips. Victory X stood up after that match had some choice words for his teammates. "Look past the games that we just lost, quit talking about them, quit complaining about a lucky spawn and look forward to the games ahead." Final Boss closed out the last game with a dominating performance in a Capture the Flag match and won the tournament. The emotions of that moment infected me with a similar passion that I felt when I watched the Red Sox defeat the Yankees in 2004. That's when I realized that MLG has captured something special. To be able to translate a videogame into a watchable sport is no easy task. 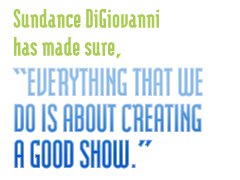 I think part of why it works is because Sundance DiGiovanni has made sure, "Everything that we do is about creating a good show." MLG is gaining steam and attracting the attention of hundreds of thousands of gamers and non-gamers alike, if the presence of corporate sponsors like Old Spice and Hot Pockets and the massive attendance at the event in Raleigh is any indication. Incredibly-skilled Halo players fighting against each other was fascinating to watch, and once I learned the stories and personalities behind the competition, I became a fan. Walking away from the event, I found myself wondering what would happen at the next event in Washington D.C. Would Elamite Warrior and Instinct go to DC with fire in their eyes and try to reclaim a tournament win? Would Final Boss defend their title? I remembered something that Sundance DiGiovanni told me. "If you've never seen baseball and I described the game to you: a guy is standing on a hill of dirt with a ball, throws it at somebody, a guy with a stick tries to hit it. It sounds crazy." Suddenly, watching kids play Halo against each other doesn't seem so crazy. Greg Tito is pretty sure that he would get killed pretty quick against Elamite Warrior or Victory X but that he could totally take Walshy.